On Wednesday, 12 September 2018, IIFA held the Graduation Ceremony for the 2018 IIFA FIATA Diploma in Freight Forwarding Class Group, while also marking the 10 Year Anniversary of IIFA delivering the FIATA Diploma directly through the Association. This event included guest speakers from previous year Groups who shared their past experiences about where they were when they undertook the training, what further education has done for them and what their careers have been like since. 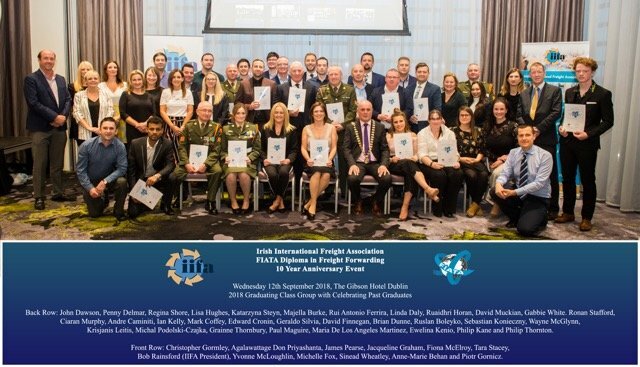 31 Participants from the 2017 – 2018 Class Group became FIATA Diploma Holders on the night. Among the guest speakers were Gabbie White, Director, Global Logistics at Alexion Pharmaceuticals Inc., Sinead Wheatley, Key Account Manager at Kuehne & Nagel Ireland Ltd., and Glen Warnock, CEO at Emerald Freight Express Ltd., all sharing their past experiences. IIFA President Bob Rainsford congratulated the new graduates and looked back on the past ten years. Bob commented that these graduates are the future of the industry and time has certainly brought truth to those words. The list of IIFA FIATA Diploma Graduates includes individuals who have progressed to become owners of IIFA member companies, Managing Directors of Multi-nationals, Logistic Managers, and others involved in specialised areas such as Customs & Trade Compliance Coordination. Other graduates represented IIFA in the annual FIATA Young International Freight Forwarder of the Year competition and closer to home, IIFA has seen three graduates become two Presidents and a Vice-President of IIFA. 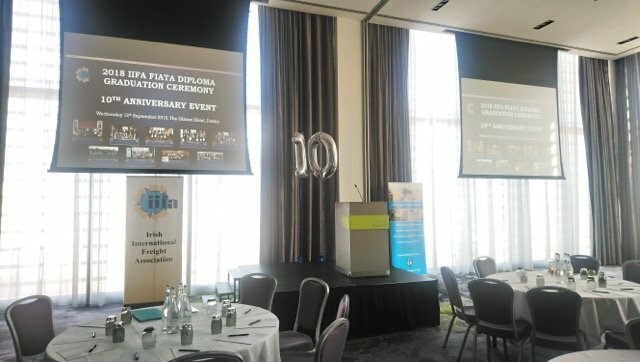 Bob went on to congratulate IIFA Secretariat Seamus Kavanagh and Grainne Thornbury for their work developing the Irish FIATA Diploma as a stand-out among FIATA’s Global FIATA Diploma providers. Ireland was among the National Associations to offer this training online and was the first to deliver training internationally, to a US Marine based in Honolulu, Hawaii in 2016.